I was checking out Kara Janx's (from Project Runway Season 2) designs. I think her clothing is great, but it looked very familiar. Check out her convertible skirt. She able to convert a 70's fashion into something new. I'm thinking if you took this skirt pattern and widened the belt - you would have something pretty close to what she designed. 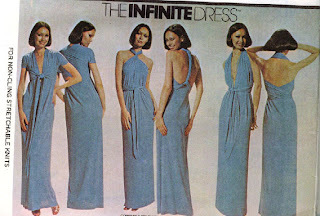 Here is another fashion from 1976 that is making a comeback- Lydia Silvesty's Infinite dress. I think it is a great concept - but my body is just not built to wear something like this, at least not in a stretch knit, and I can't see it working in anything other then a knit. I recently went to Montreal and poked around at the American Apparel store. I never saw one of these stores before! Much to my surprise, they have them in my own state. They have a Bandeau dress that is the same concept as the Infinite dress. They shortened the hem - but you can you the directions for both of them. The one thing you can do with this dress that you can't do with the Infinite dress is wear it as a halter. The Bandeau dress is a little more flared at the hem. Here is another 70s fashion that might work like the infinite dress. 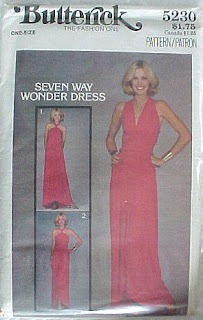 If you don't want infinite choices - you could choose only 7 ways with the Seven Way Wonder Dress! This dress completely wraps around - where the other three are tube dresses - or flared tube dresses. In 2000 another version of the 7 Way Wonder - or Infinite dress shows up as a pattern. Debra Moises wrap dress for McCall's. You can probably combine all the instructions from all of them and end up with lots of ways to wrap the patterns. This pattern has more gathers then the original 70s one and the American Apparel Bandeau dress. I'm going to have to play around with my Bandeau dress to see if I can make it work for me. I may not be built for such garments. I have just put those 3 three patterns on my to-buy-list, thanks. You may want to have a look at this thread http://www.craftster.org/forum/index.php?topic=104089.0 because there are larger (and smaller too) ladies who have posted pictures of their infinity style dresses and they look great. There are also examples of kiddie sized ones and short ones that are tops. It is a huge thread, so I reccomend checking out the pictures on pages 65, 68, 70, 82 & 83 for the general gist. 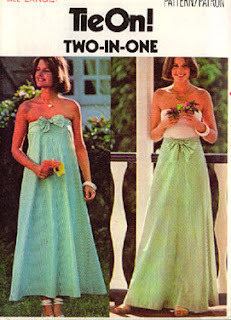 You may want to sew one of those 70's patterns after all. where can i buy these patterns from???? i am in australia and i am finding it hard to get a pattern. i would like to use it for my bridesmaids dresses. Try ebay.com to find these patterns. McCall's 2781 is available for purchase on my website. A friend of mind foundsome old patterns and gave them to me. Simplicity 8086 multi-wrap dress was one I thought would be fun to make, however, there was no instruction sheet in the envelope. 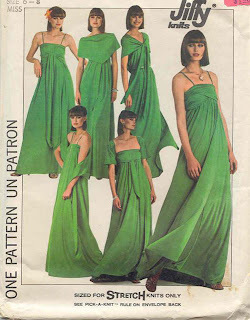 I am trying to find a copy of the instructions and Simplicity Pattern Company was no help. They said it was discontinued and they didn't have anything on it. Does anyone have any idea where I can get a copy of just the instructions? I have all the pattern pieces and can't afford the prices they are asking to buy the whole pattern. It is illegal to copy patterns. But, perhaps you have a friend who has the pattern who can lend you the instructions. It looks like Simplicity 8086 is presently an expensive pattern to have! You can also have a saved search for this pattern on ebay - perhaps you might be lucky with a bid.